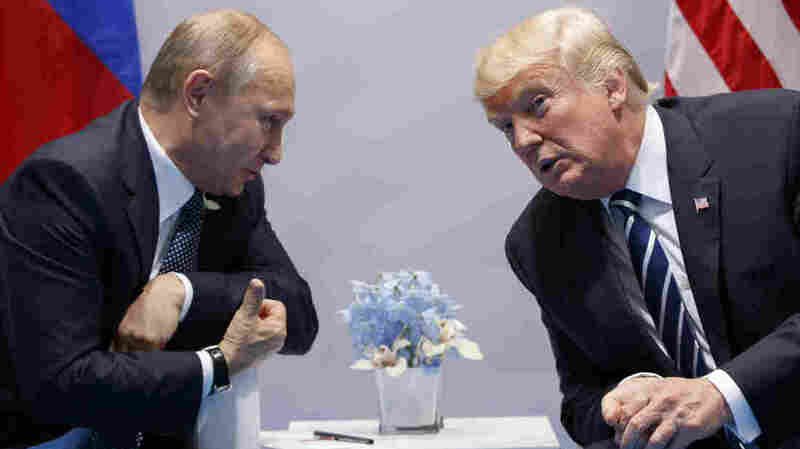 President Trump Has Signed Into Law Sanctions Against Russia, Iran and North Korea Congress overwhelmingly approved the legislation, but the White House has many qualms with it. Moscow has already responded to the sanctions, which also affect Iran and North Korea. President Trump meets with Russian President Vladimir Putin at the Group of 20 summit in early July. It's unclear how the sanctions Trump signed into law Wednesday will affect the personal relationship between the two men. President Trump begrudgingly signed into law new sanctions against Russia that had been approved by overwhelming majorities in Congress. The move is in contrast to his frequently stated desire to improve relations with the country. The president also issued a signing statement on Wednesday in which he declared that the legislation has a number of what he deems to be "unconstitutional provisions." The sanctions bill targets Russia's mining and oil industry and aims to punish the country for interfering in the 2016 U.S. presidential election as well for its military aggression in Ukraine. In announcing that he had signed the bill, Trump made his most definitive statement yet about Russia's interference in the election. "I also support making clear that America will not tolerate interference in our democratic process and that we will side with our allies and friends against Russian subversion and destabilization," he said. He also said, however, that he has a number of qualms with the "seriously flawed" bill — most notably with the fact that it restricts his ability to ease sanctions without Congress' involvement. To waive sanctions, Trump has to send Congress a report explaining and justifying his decision, and lawmakers would then get 30 days to decide whether to allow the waiver. "The bill remains seriously flawed — particularly because it encroaches on the executive branch's authority to negotiate," Trump said, adding, "The Framers of our Constitution put foreign affairs in the hands of the President. This bill will prove the wisdom of that choice." Russian President Vladimir Putin has already announced retaliation for the sanctions: The U.S. has to cut its embassy and consulate staffs in Russia by 755 people by Sept. 1. "It's impossible to endlessly tolerate this kind of insolence toward our country," Putin said of the sanctions at a news conference on July 27. The bill also applies new sanctions to Iran and North Korea. Questions had been raised about whether Trump would sign the sanctions bill because he has spoken so overtly and so frequently about wanting to improve relations with Moscow. By the time the legislation got to his desk, however, Congress had left him with little choice; both chambers had passed the bill with veto-proof bipartisan majorities. The House passed it 419-3, and the Senate voted in favor 98-2. Multiple congressional committees and a Department of Justice special counsel are all investigating Russian interference in the 2016 election and possible links between top Trump campaign aides and Russia. The U.S. intelligence community has concluded that Russian intelligence services, acting at Putin's direction, conducted cyberattacks aimed at helping Trump during the campaign. The president has repeatedly denied that he or anyone involved in his campaign colluded with Russia, and Putin has repeatedly denied that the Russian government had any role in the hacking of emails and their strategic release at key moments during last year's presidential race. Notwithstanding the multiple investigations and the cloud that Russian interference has cast over Trump's presidency so far, the two leaders have seemed to be developing a friendly relationship. After Trump and Putin met on July 7 in Hamburg, Germany, Secretary of State Rex Tillerson said the pair had a "clear positive chemistry" as they talked for more than triple the time that had been scheduled for the meeting. "There was such a level of engagement and exchange," Tillerson said, that "neither one of them wanted it to stop." It was later disclosed that Trump had had another reportedly hourlong conversation with Putin at the same global summit without the presence of any of his staff or even an interpreter. This sanctions bill is likely to affect the relationship between the two men and their two countries. The White House at first hedged about whether Trump would sign it but then released a statement saying the president intended to sign the bill — putting to rest questions about whether Trump would force Congress to override a veto. Vice President Pence also voiced support for the sanctions and criticized Russia during a visit to the Baltics this week. "At this very moment, Russia continues to seek to redraw international borders by force, undermine democracy in sovereign nations and divide the free nations of Europe, one against another," Pence said at a press conference in Estonia on Monday, according to CNN. Pence also reaffirmed the United States' commitment to the defense of NATO countries as part of the alliance's mutual defense agreement. But the vice president also said he was hopeful for "better days, for better relations with Russia." The same goes for the American public. According to an NPR/PBS Newshour/Marist Poll released last month, a plurality of Americans thought Trump's goal of improving Russian relations was a "mostly good thing." That poll was conducted, however, before details emerged about Donald Trump Jr.'s meeting last year during the campaign with a Russian attorney, two Russian-Americans and two top aides of the Trump campaign. According to emails released by Trump Jr. that detail plans for the gathering, the president's eldest son was told beforehand that the Russian attorney would be bringing incriminating information regarding Democratic candidate Hillary Clinton provided by the Russian government in order to help his father's presidential campaign. But Trump Jr. and the lawyer, Natalia Veselnitskaya, have both said that no such information about Clinton changed hands at the meeting.